1. The construction hoist elevator is an external construction hoist with a three- drive rack and pinion mechanism. 2. The construction hoist elevator is equipped with a state-patented safety device which can brake automatically in case of accidental fall. The driver element on top of the cage is safe and reliable and convenient for maintenance. 3. The construction hoist elevator is widely used for construction work such as industrial and civil construction, bridge construction, underground mining, large chimney construction and the shipping industry. 4. 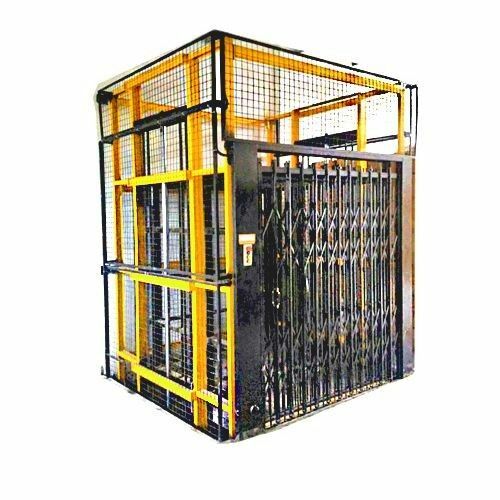 It can be used for transporting materials or people vertically, as a permanent or half-permanent lift, or in places like storehouses and tall towers. 1. The steel structures are made of high-quality steel materials. 2. The surface paints for the products are prepared with the imported raw materials, with bright and long lasting colors. 3. The machine is fitted with a variety of reliable safety interlocking device, safety switch, circuit breaker, upper and lower limiters and ultimate limit switch, etc. 4. Progressive safety device and safety hooks are mounted. The safety design and configuration of the equipment can comply with the national standards. 1. The Construction Hoist Elevator is widely used in indoor or outdoor of the buildings and warehouse. Used to lifting the goods or pallets between the floors. 2. To provide fast, efficient, convenient and safe access to mezzanines, basements, and any levels in multistoried building. 1. Q: What’s your MOQ? 2. Q: What’s your package? 3. Q: What’s your delivery period? 4. Q: What kinds of products do you have? A: Suspended Working Platform,Luffing Crane,Suspended Platform Cradle,Suspended Platform Cradle,Construction Hoist Parts; etc. 5. Q: Do you provide lift tools? A: Yes, we can provide any kinds of lift tools such as lift sling belt, lift clamp, grab, magnet , pulley blocks, hook, lock catch, wire rope, fiber rope, etc.